adorable! i love the teddy bear and all the colors! ahaha is it just me or is Pauline sucking her thumb? Awwww, now they’re babysitting together! :3 Cuties! I wanna have a teddy bear like that! 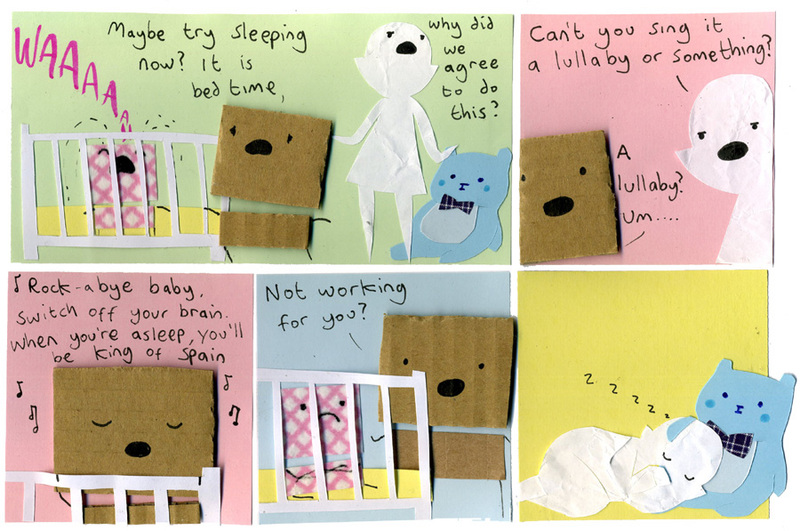 “Can’t you sing *it* a lullaby or something?” Love it! but cos Collin is so epic i bet it was the first one! Colin looks so adorable while he’s singing!! Look at Pauline, happily dreaming of being king of Spain. Only that lullaby could work on a megalomaniac like her. Hey, at least the baby stopped crying! Also, Pauline always looks so cute… as long as she’s sleeping.